Great Wall of China Hiking ​- Beijing's world-famous hiking along the Great Wall! What is the Great Wall of China Hiking? Hiking through Great Wall of China, especially exploring the Great Wall of China (Jiankou) is to challenge your own will and perseverance. Hiking it, you will shock at the wisdom and the hard-work of the people in the ancient China. If you enjoy hiking, hiking through Great Wall of China is a fantastic experience. As the Great Wall of China offers several sections to explore, please view the popular hiking routes as follows. 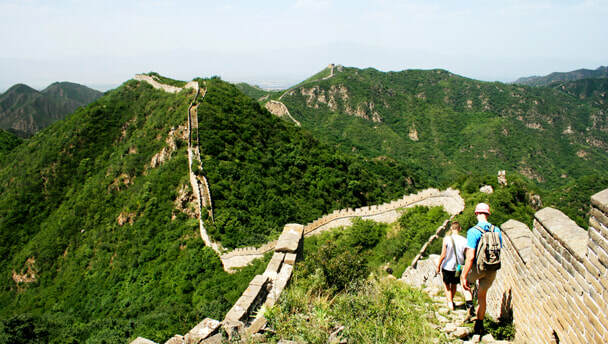 As it always takes several hours to hike through any one of the routes listed above, the best time to hike through the Great Wall of China is in the morning. The best months to hike are from March to June and from September to November. As for the transportation, please visit the related pages on our website as each section of the Great Wall of China is in a different section of Beijing/outskirts of Beijing. Great Wall of China (Jiankou) is steeper than other sections. It hasn’t been repaired. Therefore, when you explore it, please take care of yourself and bring enough equipment (such as flashlights, batteries, trekking poles, sleeping bags for the sunset and the sunrise, etc), drinking water and food with you. This section is free of charge and it is open for 24 hours a day. If you are planning to hike in summer, it is not recommended that you explore it from 11:00am to 15:00pm as it is the hottest time during the daytime in summer. It is strongly suggested that you take a map with you to avoid being lost in the wild. Interested in hiking the Great Wall of China on a Tour? Wendy Wei Tours offers a variety of different packaged tours as well as custom tours including Great Wall of China Hiking, among other attractions and destinations. To find out more, please visit our Tours page or Contact Us directly to find out more.